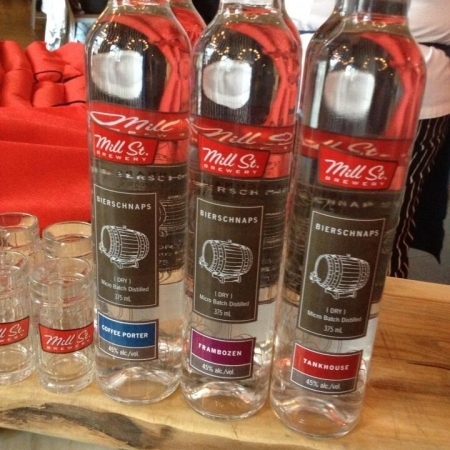 TORONTO, ON – After several weeks of delays, Mill Street Brewery has received approval to sell the unique Bierschnaps that is being made in the recently opened Mill Street Beer Hall adjacent to the Mill Street Brew Pub in Toronto’s Distillery District. Available in three varieties created using Mill Street’s Tankhouse Ale, Coffee Porter and Frambozen, Bierschaps is a made by distilling the beer along with cane sugar, resulting in a clear and dry 45% abv spirit that is meant to be served ice cold. All three versions of Mill Street Bierschnaps are available now in the Beer Hall and Brew Pub where they’re being sold in individual shots, and in 375 ml bottles for take home purchase in the retail store at the Brew Pub entrance.